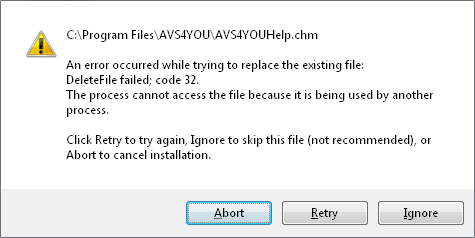 Make sure the AVS4YOUHelp.chm file (from which you got the download and install link) is not opened at the moment. If so, please close it and click Retry. Make sure all the AVS4YOU programs are closed. Usually they do not prevent from installing the help .chm file, but in some cases this could be the reason for the error. Note: please note that some AVS4YOU programs (AVS Firewall, for instance) can run in background and can unload them using their system tray icon.